If you’ve ever tried Korean tacos from a food truck we think you’re going to love these Four Fabulous Recipes for Korean Beef Tacos! Use the slow cooker or the pressure cooker and make Korean Beef Tacos for your Taco Tuesday dinner tomorrow! 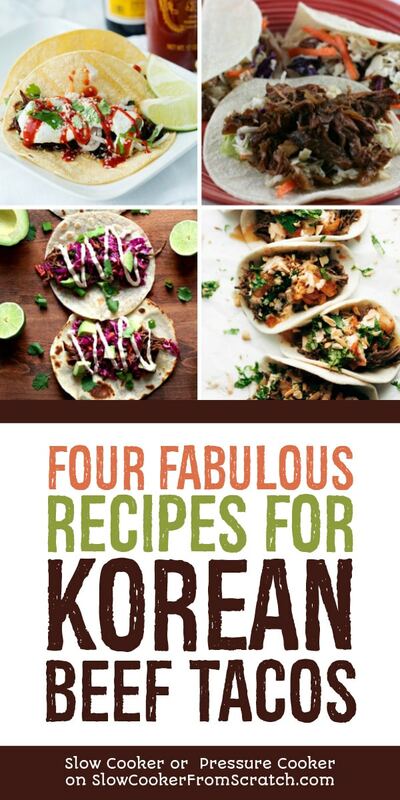 Click here to PIN Four Fabulous Recipes for Korean Beef Tacos! These Four Fabulous Recipes for Korean Beef Tacos all start with an ordinary beef roast cooked until fall-apart tender in the slow cooker or Instant Pot. But when you add garlic, ginger, onion, soy sauce, sesame oil, brown sugar, and a little heat to just-an-ordinary-beef-roast before the cooking begins, it magically turns into some amazing Korean beef! For all you food truck taco lovers we’re updating this post to include Four Fabulous Recipes for Korean Beef Tacos! 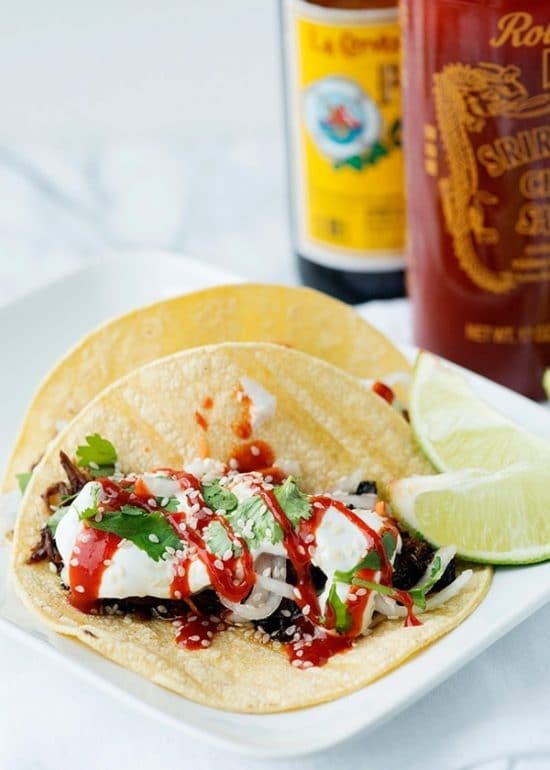 These are food-truck style tacos you can make right in your own kitchen, and we’ve included two slow cooker Korean beef recipes and two Instant Pot Korean beef recipes so you can choose the cooking method you prefer. Serve the Korean Beef in corn or flour tortillas, with kimchi or cabbage slaw and a squeeze of lime. Perfection! All photos are copyrighted to the site that posted the recipe. Just click the recipe name under any photo to see the complete recipe on that site. These Slow Cooker Shredded Korean Beef Tacos from A Year of Slow Cooking sound like a must try! The ingredient list has brown sugar, soy sauce, garlic, onion, ginger root, rice vinegar, sesame oil, and jalapeno, and I’m positive all those flavors have to taste amazing when they cook all day on low with a chuck roast. There’s also a recipe for an Asian cabbage slaw to serve in the tacos. Use gluten-free soy sauce and corn tortillas to make this gluten-free. Karen says these Pressure Cooker/Slow Cooker Korean Beef Tacos from 365 Days of Slow Cooking are “like a party in your mouth. All the flavors and textures come together in a perfect union!” Karen also has slow cooker instructions if you prefer that method. Lindsay says these Instant Pot Korean Beef Tacos from Pinch of Yum are “food-truck fusion-style tacos, straight outta the Instant Pot!” Don’t you think they look good? Slow Cooker Korean Beef Tacos from Baked Bree start in the morning in the slow cooker, and by dinnertime, you have tender fall-apart beef. Serve with kimchi or cabbage slaw and a squeeze of lime and you’ve got yummy Korean beef tacos for dinner! Use the Index Page for Beef to see all the slow cooker or pressure cooker beef recipes that have been featured on this site. This is a recipe that I found on that site a while ago and have made it several times. It is absolutely delish! And the slaw is a great side to go with. Really yummy. Thanks Karen; always glad to get nice feedback about the recipe! Thank you, Kalyn for posting my tacos! I'm so happy you enjoyed your dinner, Karen. Stephanie, I'm getting a fun mental image of a table full of kids happily eating these!